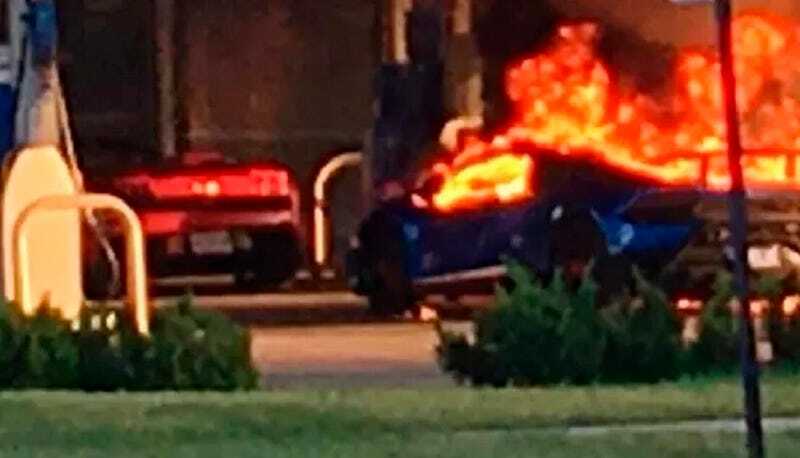 Following the recent GoldRush Rally, which began in Boston on June 22nd, and ended in Las Vegas, Nevada last Sunday, two Lamborghini-driving participants were presumably heading back home when one of them suffered a huge automotive loss outside of St. Louis, MO. The deep blue Huracan Performante burned down to the hulk of scrap metal you see in the photos below. According to various reports posted to social media and by news stations Fox 2 Now, another vehicle was fueling next to the Lamborghini and drove away with the pump still in their fuel filler, breaking it away and causing the pump to spray fuel, which ignited on the Lamborghini’s hot exhaust. So...this kid, or young guy, pulled out of the station with the gas hose still in his car. It broke away, gas came out and it somehow caught fire. Speculators opinions-the Lamborghini, being close to the ground, had a hot exhaust pipe and it lit it. Someone else said he was smoking. Someone said a spark. 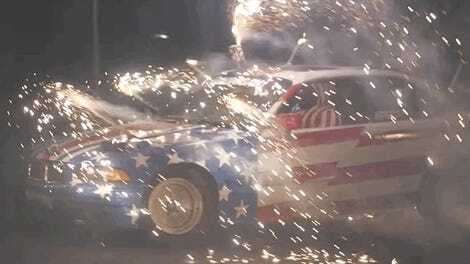 Someone said the Lamborghini was running. All I know is I saw the Lambo guy yell at the kid that he owes him $400,000. The fire occurred just before 8 p.m. local time on Saturday evening. Both the Lamborghini and the fuel pump next to it were destroyed beyond recognition. The local fire department was on the scene in short order and the fire was extinguished quickly. Luckily for all involved, reports from the scene indicate that nobody was injured in the blaze. Is Lamborghini Secretly Showing Off A Hybrid?